Kerry’s classic tour. Take the traditional route or add extra days to enjoy the many off-the-beaten-track roads along the way. 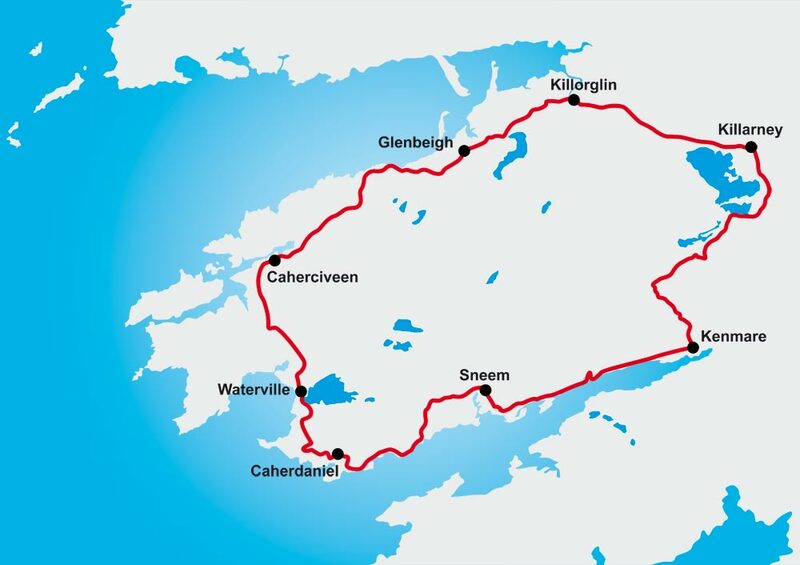 The Ring of Kerry traditionally starts in Killarney town, heading in an anti-clockwise direction towards the first town on the route, Killorglin. Built on the river Laune, this lively town is famous for one of Ireland’s oldest festivals, Puck Fair which takes place every August. From here, the route travels west toward the village of Glenbeigh. This village comes to life in the summer as it has been luring visitors since the 1850’s. Take time to travel a very short distance off the route to visit the 8km long Rossbeigh beach, stretching out into Dingle Bay. Onwards along some magnificent mountain and coastal scenery and, 27km from Glenbeigh, our next stop is the market town of Cahersiveen. Described by poet Sigerson Clifford as “The town that climbs the mountain and looks upon the sea”. Experience the local history of the town and surrounding areas at the Old Royal Irish Constabulary Barracks. Built in 1875, it is now an Interpretive Centre and will provide you with a rich insight into the history and traditions of the region. 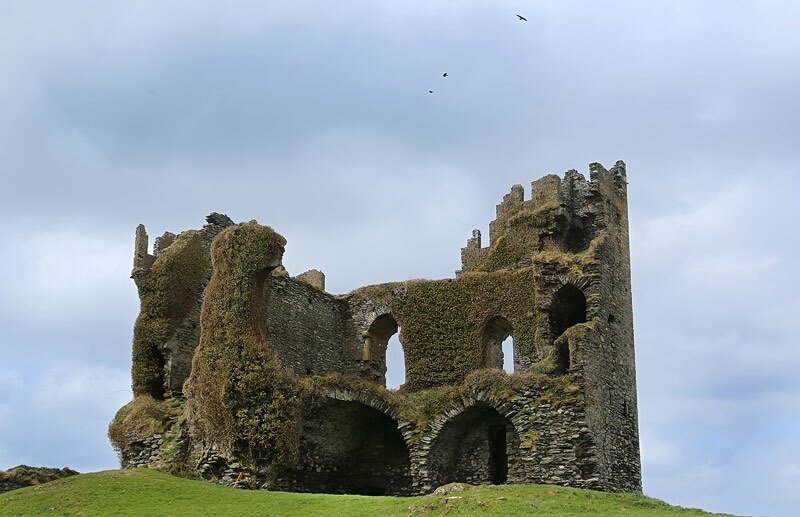 Close to the town, other sites slightly off the main route are the 15th Century Ballycarbery Castle and the iron age Leacanabuaile fort and Cahergal fort. 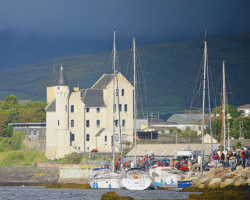 Just outside of Cahersiveen is the Renard-Valentia Island ferry, a great time saver to get onto the beautiful island, and directly to the village of Knightstown. 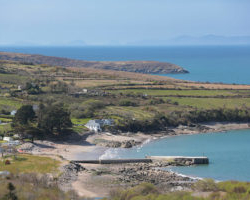 This off-shoot of the ring of Kerry is well worth the visit, and you won’t be disappointed! 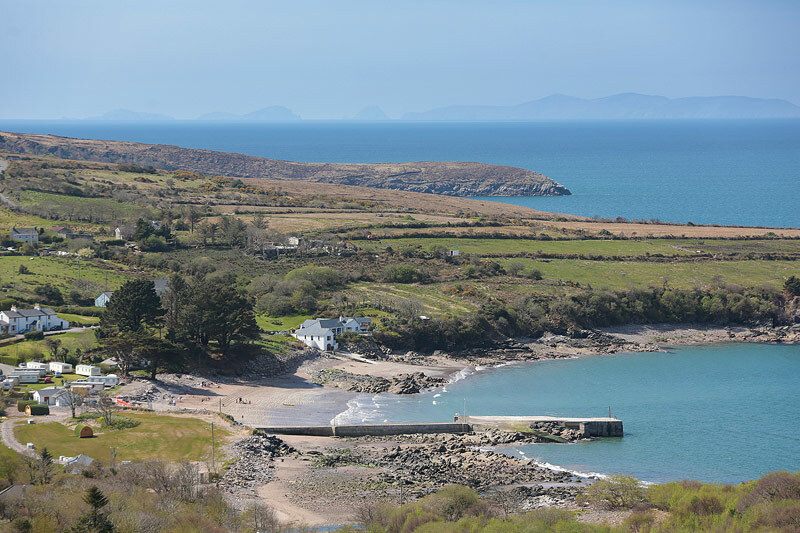 If you prefer the longer route, cycling further along the main Ring of Kerry from Cahersiveen, a right turn will take to in the direction of Portmagee village, from where a bridge will take you across to Valentia Island. 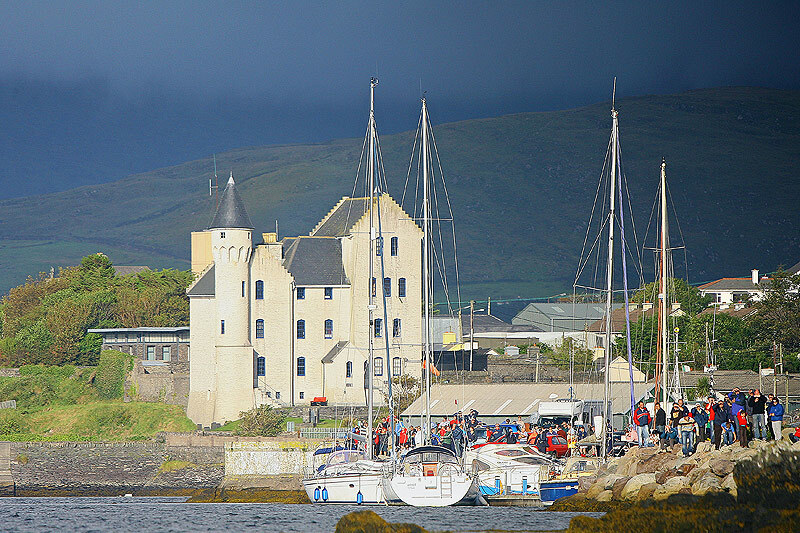 Portmagee is a charming little fishing village and departure point for many boat trips to the Skellig Islands. Hardly in need of an introduction, Skellig Michael, a UNESCO World Heritage site has early Chrstian monastic ruins dating back to 600AD. 670 steps take you to the top of the island, and an experience you’ll never forget. The Great Skellig is also home to a wealth of birdlfe, most noteworthy being the puffin. The neighbouring Little Skellig is home to the second largest gannet colony in the world with 26,000 pairs. We had great cycles yesterday and today, particularly on the high road along the coast, great climbs and the awesome view. 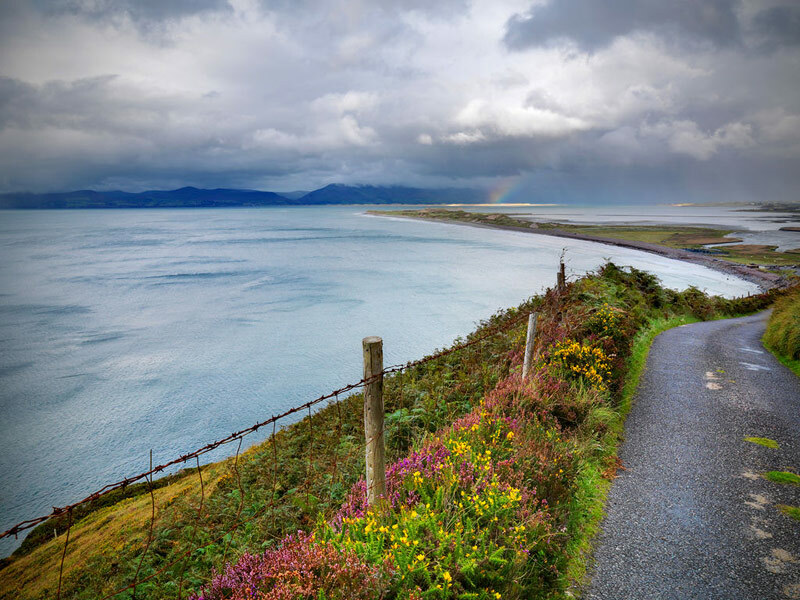 It was simply the best ride we’ve ever done – the ring of Kerry route. Back to Valentia Island, where and a wealth of signtseeing and history await. Visit Cromwell Point lighthouse, the footprints laid down between 350 and 370 million years ago by the Tetrapod, the Valentia slate quarry, which provided slate for the Houses of Parliament, Westminster Abbey, St Paul’s Cathedral and the Paris Opera House, to mention a few. 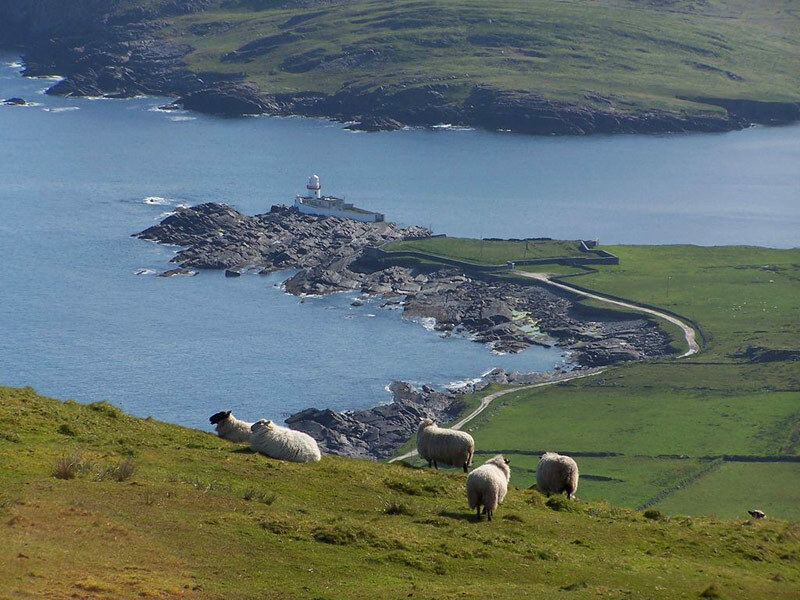 Cycle up to Geokaun Point for the finest 360 degree view, and back to Portmagee by Bray Head. 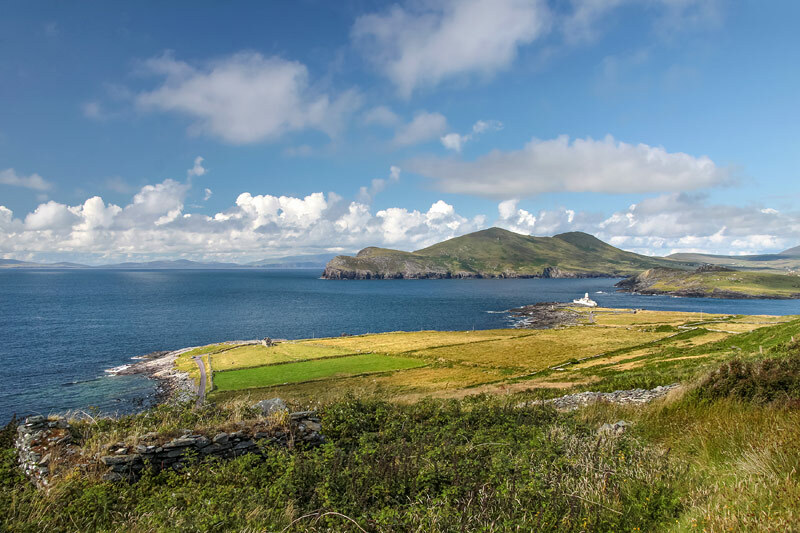 If time is on your side, continue along the Skellig Ring route, through Ballinskelligs and back onto the Ring of Kerry, before reaching the town of Waterville. Famously visited by Charlie Chaplin, Waterville looks out onto Ballinskelligs Bay and is backed by the beautiful Lough Currane. A haven for anglers, the fishing season opens on January 17th and closes on September 30th. 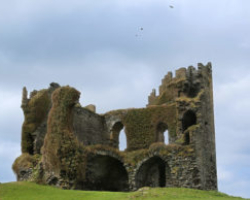 Pleases of interest are Church Island on Lough Currane, Loher fort, dating back to the 9th Century, and of course, Waterville famous links Golf Course. Leaving Waterville, cycle up and over Coomakista Pass, another stop along with way with stunning coastal views. Next, its downhill to the little village of Caherdaniel, close to the former residence of the ‘Liberator’, Daniel O’Connell. 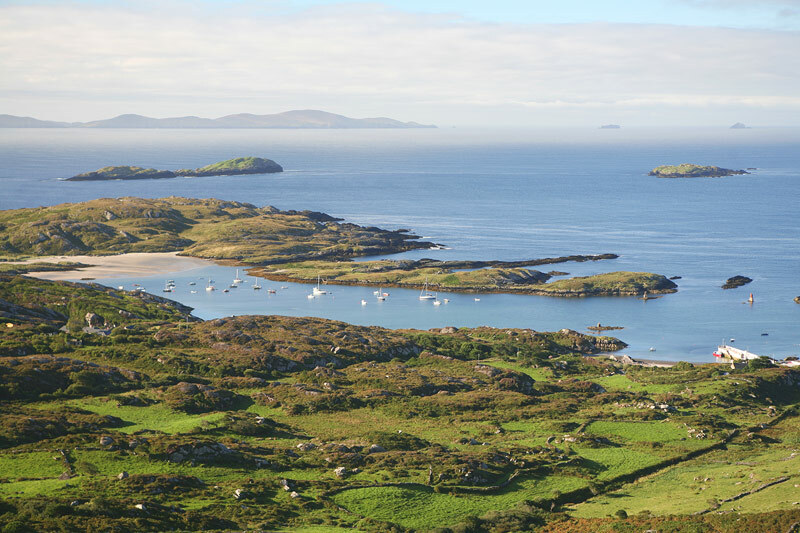 Derrynane House is situated on the shores of Derrynane Bay and is well worth a visit. Derrynane Beach, a short stroll from Derrynane House is a spectacular little beach, located alongside Abbey Island, home to 6th century ruins and accessible on foot from the beach. From here its onto Sneem, a picturesque little village which won Ireland’s National Tidy Towns Award in 1987 and the National Landscape Award in 1997. 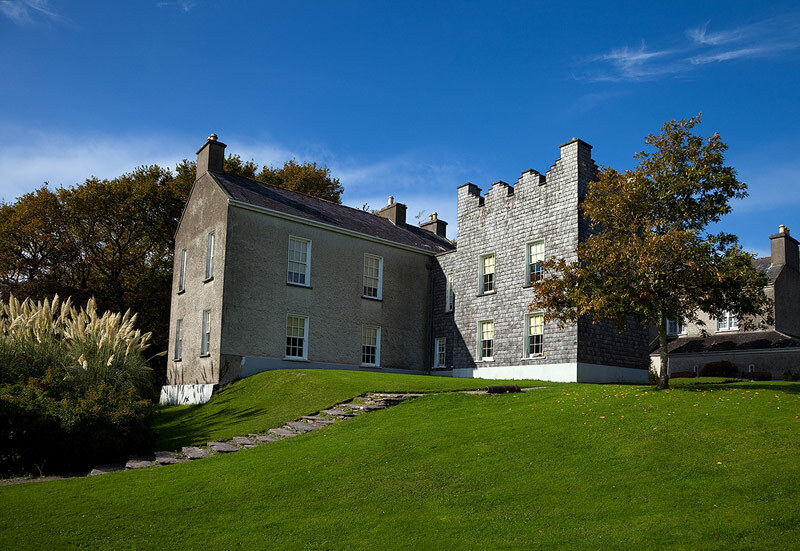 Sneem is home to a sculpture park featuring works by a variety of artists. Continuing from Sneem, pass by Parknasilla, over Blackwater Bridge, through Templenoe and into the heritage town of Kenmare. 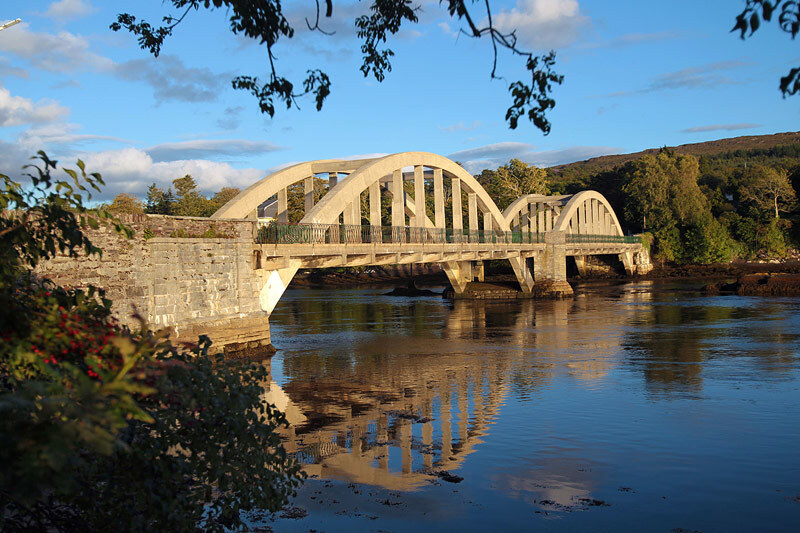 Located at the head of Kenmare Bay the town dates back to 1678 and is known for its gourmet food and cosy bars. 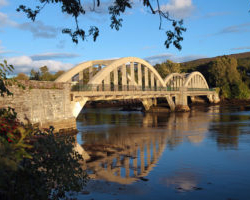 Twice winner of the National Tidy Towns Award in 2000 and 2008, the town’s original Irish name was ‘Neidín’ meaning ‘little nest’, due to its location nestled among the surrounding mountains and Kenmare Bay. 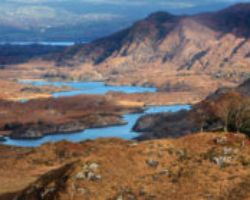 10km outside of Kenmare, ascend to Molls Gap with its view down into the Black Valley and the 25,000 acre Killarney National Park. 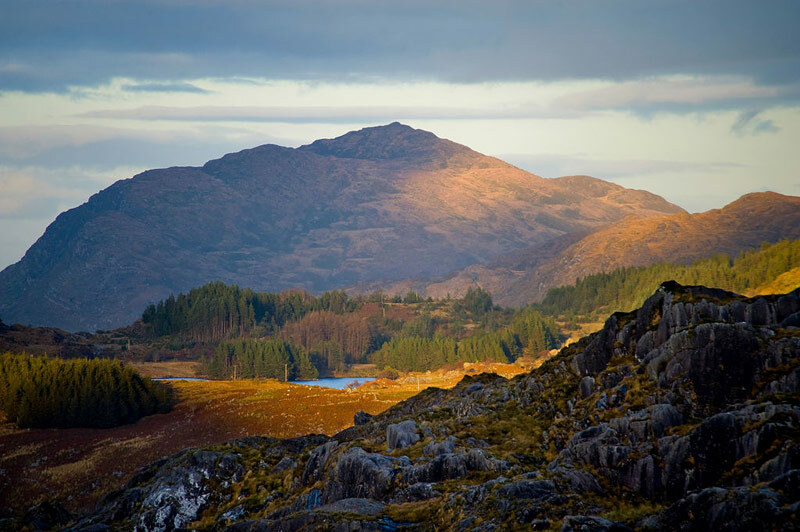 Next comes a stunning downhill route passing the famous viewing point ‘Ladies View’, Derrycunnihy Church and past Killarney’s Upper and Middle Lakes before coming to Muckross, home of the famous Muckross House, Gardens and Traditional Farms. Only a short spin from here, pass Killarney Bike Rental and into Killarney town. It is 1400 years since monks first settled on Skellig Michael. 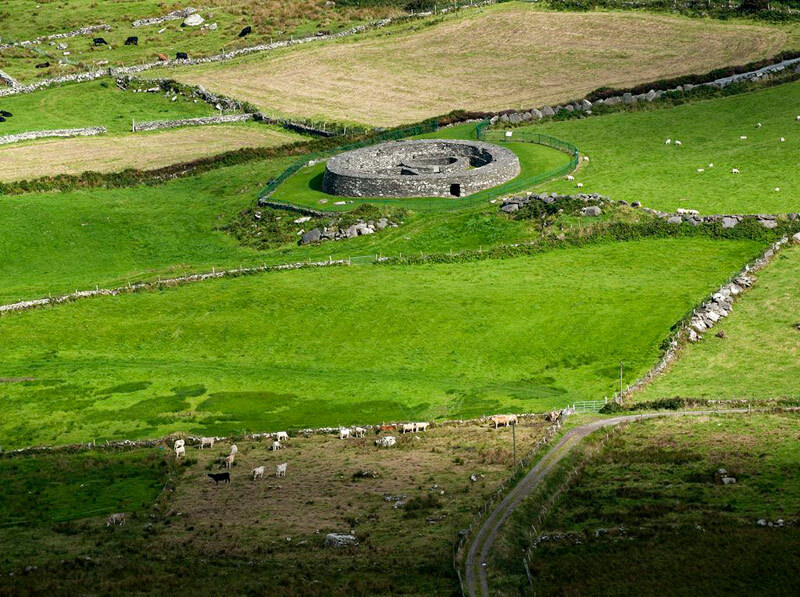 It is 5060 years since first evidence of farming on Valentia Island. 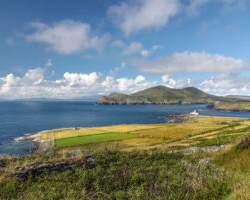 It is 1160 years since Vikings lived on Beginish Island, Valentia Harbour. 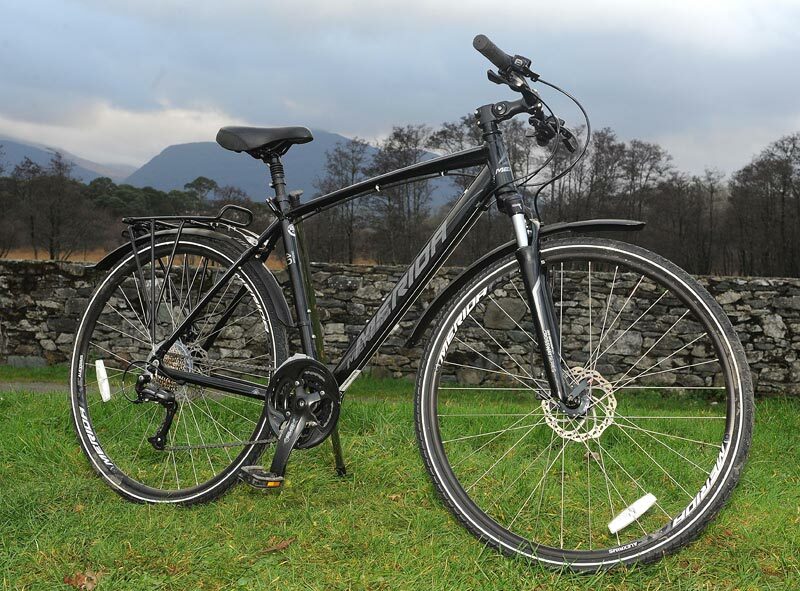 “I would highly recommend using Killarney Bike Rental and bikes, the way to go, as it’s just so easy to get around”.